There are many venomous creatures here in the Sonoran Desert, including numerous rattlesnakes, Arizona Coral Snakes, Gila Monsters, scorpions, Arizona Brown Spiders, Black Widows, centipedes, and various ants, bees, and wasps. I usually try to keep a careful eye out for all of these potential threats, but I have had a few close calls. I have avoided being bitten or stung by all of these venomous creatures except for the occasional ant, bee, or wasp, which are just impossible to completely avoid. Ironically, the only venomous creature to cause me any serious harm here in the Sonoran Desert was a little, harmless-looking, fuzzy, green and black caterpillar. I never got a photograph of the offending caterpillar, a Mesquite Stinger (Norape tenera), but the above caterpillar (Norape sp.) looks similar to it and is also likely venomous. It was a hot and humid day late in the summer of 2006, and I had spent the day photographing wildflowers in the foothills of the Santa Rita Mountains south of Tucson. While pushing through some dense brush, I had somehow managed to pick up a Mesquite Stinger caterpillar. The caterpillar crawled unnoticed into my shirtsleeve underneath my arm. My shirt was a loose blouse style, so I didn't feel the Mesquite Stinger right away, but whenever I moved my arm back, I felt prickly stinging under my arm. I kept checking on my skin and even looked in my shirt, but I didn't see anything. I had thought that I might have picked up some cactus glochids (micro-spines) or something similarly prickly but hard to see. The stinging continued, and the stinging site began to itch quite annoyingly, so I just kept scratching at it. Finally, I had had enough and we went home so that I could get a shower and a change of clothes. When I took off my shirt, I found the somewhat battered-looking Mesquite Stinger in my shirtsleeve and finally knew the cause of my misery that day. However, my misery was far from over. The repeated Mesquite Stinger envenomations combined with my being sweaty and scratching at the sting site all that day had caused it to quickly become infected. I ended up with cellulitis, an acute, spreading bacterial infection of the skin. I had an inflamed red patch about the size of my hand where the Mesquite Stinger had stung me, along with chills and a fever. The symptoms of cellulitis are a spreading patch of redness, heat, swelling, and tenderness at the site of an infection. Chills, fever, streaks of red spreading from the infection site, and other symptoms may also be present. Cellulitis can be serious and even rapidly life threatening in some cases, so it's best to seek prompt medical care with any symptoms of cellulitis. Obviously I recovered, but it was still quite scary, especially since it all started so small with just a little, harmless-looking, fuzzy, green and black caterpillar. 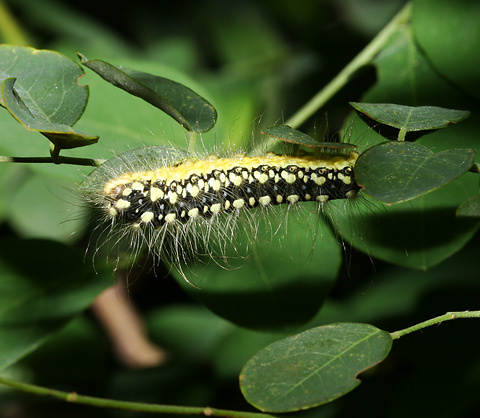 Quite a few caterpillar species have stinging hairs or urticating spines as defense mechanisms to protect them from predators, which is why it is best to avoid touching any fuzzy, hairy, or spiny-looking caterpillars. Mesquite Stinger caterpillars are mainly found on desert trees like Mesquite (Prosopis spp. ), Acacia (Acacia spp. ), and Paloverde (Parkinsonia spp.). Adult Mesquite Stingers are fuzzy brown and white moths, and they are certainly not the only moth in the genus Norape or even in the Flannel Moth Family (Megalopygidae) with stinging caterpillars.